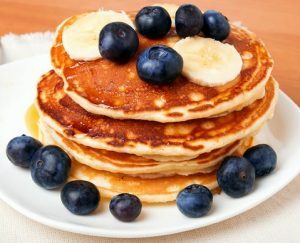 Pancakes – a classic breakfast option that vegans may find difficult to go without. Pancakes – a classic breakfast option that vegans may find difficult to go without. Many restaurants use dairy in their pancakes, but it’s very easy (and tastes even better!) when you use all vegan ingredients. This Vegan Blueberry & Banana Pancake recipe is decadent, filling, savory and easy to make! Breakfast has never been so healthy and delicious. Step 1: In a medium mixing bowl, whisk together melted margarine, vanilla, mashed banana, sugar, orange juice concentrate and almond milk. Turn on your stove to medium heat. Now, add remaining dry ingredients (salt, flour, cornstarch, and baking powder) and whisk together until a smooth batter develops. Step 2: Spray pan or griddle with cooking spray, then measure ¼ cup of batter on the pan. Step 3: Add blueberries with caution to each batter portion, approximately 6-8 blueberries on each. Flip the pancake when the edges start to become dry and the batter is slightly bubbling. Step 4: Serve pancakes with real maple syrup. Add sliced bananas, more blueberries and walnuts if desired.